When assessing your rearing stock and noticing an obvious fault, it can be very disheartening. An otherwise-fine specimen is ruined for show and breeding. However, If the fault in question is observable in the bird’s parents or grandparents, perhaps you only have yourself to blame? We would all breed from near-perfect specimens if we could, but in many cases they’re not available for selection. The question has to be: ‘Why?’ I believe much of it has to do with weakness. Those specimens that look really promising as growers (and probably would be superstars), are becoming more difficult to get to fully grown. Whether a bird carries split-wing or not can be identified once the wing is fanned out. 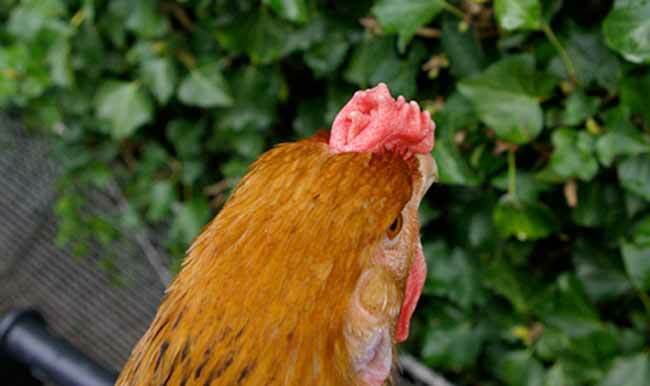 It is a fault in many standard poultry breeds and is caused when a feather called the ‘Axial’ is missing. This feather should be situated between the primary and secondary feathers. 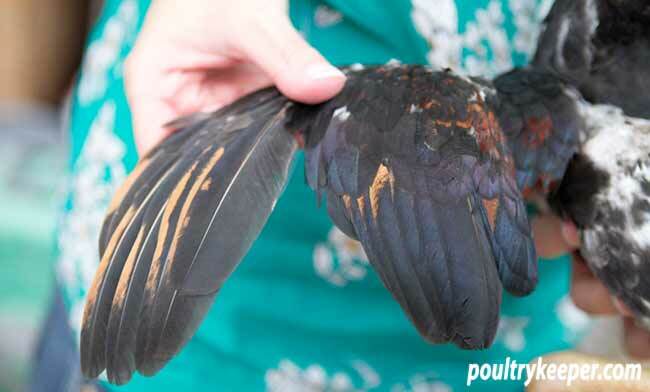 A lack of this feather causes a visual gap known as ‘split-wing’ and suggests weakness of the wing. 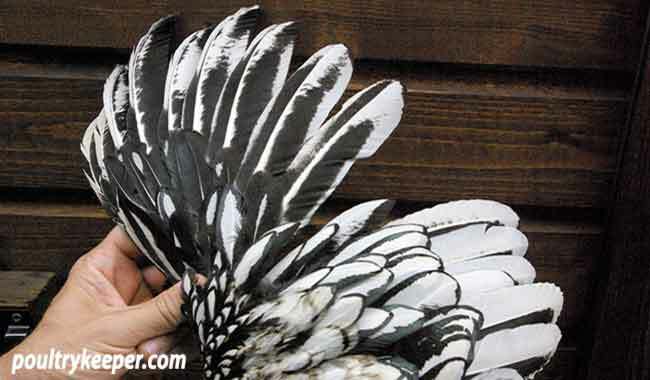 Split-wing in a Silver Laced Wyandotte male: a bad fault & the bird shouldn’t be bred from. There are many variations when it comes to a split-winged bird. In profusely feathered chickens the wings can appear split, but are just really ‘loose-feathered’ with a larger gap than is desirable between each wing feather, including where the primaries meet the secondary feathers. Orpingtons are notorious for this type of wing. It stands to reason as the feathers are loose all over to give them that soft and fluffy appearance. Some birds will display one wing that is correct and another that is split. Other birds will appear split-winged in their first year but moult through with better wing feathering. However, such cases are quite rare. Generally, split-wing comes in the form of a gaping hole when the wing is opened and is an unattractive sight for breeders. Particularly when buying at auctions – it is not possible to remove the birds from their pens and inspect whether or not they carry such a fault. It is often only after the sale is completed and the buyer goes to transfer his or her new birds to a carry box that the split-wing fault is discovered. I have carried out many tests with ‘split-winged’ stock and it appears to be a simple recessive gene. In other words, the only way to avoid it is to breed from birds with good wings. Quite why only one wing becomes split sometimes, is little understood. it would appear conclusive that birds which appear correct in their wings can be carriers of the split-wing fault. This makes sense, because breeders would never knowingly breed from split-winged stock, so the fact one cannot see which birds are carriers means they can be forgiven for using them in the breeding pen. Unless you ‘pair mate’ it won’t be possible to tell which female in the breeding pen was the guilty party, but you will be able to instantly know which male is to blame. Such males should not be bred from and NOT be sold on at auctions. The fault will only resurface and it isn’t fair on unsuspecting buyers and future breeders of your particular breed. Breeding a bird with good wings to a split-winged bird will produce offspring with good wings. However, the fault will soon resurface in future generations and come back to haunt you. As sod’s law goes, you can bet that the fault will emerge in a bird that is otherwise perfect in every way and you will kick yourself for ignoring this advice and breeding it in. In most standard breeds of poultry, the split-wing defect is considered a major fault in the show pen. All soft feather breeds are required to have good, strong wings when opened. However, some hard feather breeds like Asian Game have split-wing, which is embraced in varieties such as the Ko Shamo bantam shown in the photograph below. A Ko Shamo stag’s wing. Photo courtesy of Ian Wileman. It is important to determine whether the bird you are assessing for the fault is in fact heading into an annual moult. The best age to check for this defect is when a fowl is around the 30 weeks of age mark. By this point it will be fully mature and will not moult for a considerable amount of time. 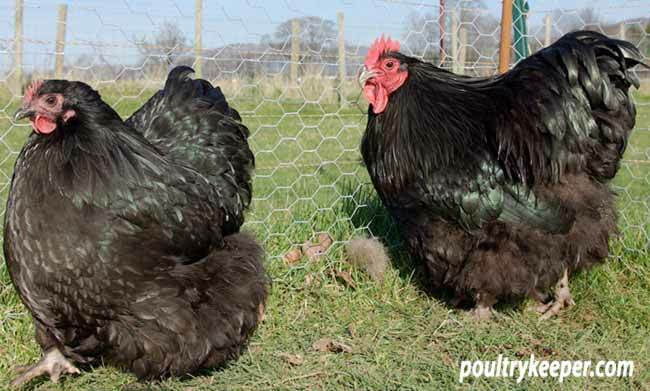 There are many myths in poultry and one I find perplexing is: “Black males with red in the hackle, produce excellent Blacks with beetle-green sheen”. This may appear to be the case but it’s not good advice for breeders. Black birds invariably are built on the ‘Extended Black’ platform, and stripped down would look like a Brown-Red (Gold-Birchen). When any red pigment appears in the neck hackle of a male from a line of Blacks, all it means is that one of the genes to make the bird ‘all-Black’ is missing. You often hear: “Yes, but it doesn’t affect the offspring – they all come self-Black with no sign of red hackle.” This can be attributed to the female in the breeding pen possessing the full unit of genes for self colour and passing it on to her sons. Ultimately, by breeding red hackles into your line of Blacks, all you are doing is perpetuating the ‘incompleteness’ of self-colour genes which will no doubt come back to haunt you in future. Wry tail is another annoying fault – it crops up in flocks as a percentage that suggests ‘recessive gene’ but isn’t fully understood. One friend, and breeder, had a fine male with its tail going off to the left. He also had a female with a tail going off to the right. His mentality was by crossing them together, the tails of their offspring would ‘join in the middle.’ I think he made this cross in a less than serious vein, but ironically, he will have his share of wry tails to deal with in future, even if the first cross yields good results. avoid breeding from birds with the problem (even if they pop out). 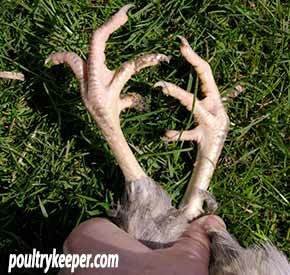 Bent toes can be caused by factors aside from recessive genes, but always breed from straight-toed stock, and ensure your brooder bedding isn’t too hot. A friend of mine had a breeding pen set up last year consisting of a trio of birds. The male and one of the females were fit for purpose, but the other female had bent toes. I tried hard to persuade him not to use that bird, but he knew best. “Well, it may have been caused by the brooder being too hot etc – you don’t know it’s genetic.” True, I don’t, but this year half the birds from that pen, which are otherwise very good, have bent toes. He still doesn’t see who’s to blame. What more can you say? Green eyes (irises) in many soft-feather breeds are often a problem. What’s worse, in many cases, they appear a desirable shade of orange in the first year but drastically fade in year 2. A good example would be some strains of large Light Sussex or Partridge Wyandotte bantams. With such lines it is always best to breed from birds that are at least 18 months old. Green eye is a recessive gene. The words ‘recessive gene’ have been used a lot in this text and most faults are ‘recessive.’ Why? The answer is quite simple: the majority of us wouldn’t breed from faults and are always selecting towards a given ideal across the range of desirable features. The last thing we want is split-winged stock, for example (aside from Asian Game), so we wouldn’t have it in the breeding pen. If it was dominant, it would be so much easier to permanently breed out. It would be like breeding rose combs out of Orpingtons – once they’re gone, they’re gone indefinitely! It would be so much easier if faults were dominant. As breeders, some of us need to ‘up our game,’ cut down on stock and have a good rethink. The late Dr Carefoot would despair if he could see some of the breeding pens I’ve witnessed recently. He didn’t win ‘Breeder of the Year’ 9 times in a row at the National by using substandard stock; he only ever bred from the very best, which he created through diligent selection. The amount of times this year I’ve heard: “You know that fault you said not to breed in, well guess what, I’ve got quite a few birds with it this time.” As you may imagine, sympathy is in short supply. As with the ‘red hackle in Blacks’ example earlier, it is easy to see why people reach certain conclusions. They breed the fault in, don’t see it in the offspring and then advise everyone else to do the same. An example is breeding a split-winged bird to a bird with good wings. The progeny would all have good wings. However, if the split-winged bird was bred to a ‘split-wing carrier’ then the results would be quite different. This time half the offspring would be split-winged, the remainder being carriers. To me, advocating breeding a fault into a line because you: “Don’t see it again” is ludicrous. It’s like crossing a single combed bird with a rose combed bird and expecting single combs not to reemerge in future generations. If the genes are pure respectively, there won’t be any single combs in the first generation, but sure enough they will be passed on and come back to haunt breeders in future. The same rule applies with many faults so please don’t breed them in! Poultry breeding these days has enough challenges without making it more difficult by breeding in needless faults. Aside from the handful of accomplished breeders in each breed club, we are in danger of losing the skills of our past masters. Furthermore, it doesn’t reflect well on us as breeders. Becoming an all-round fancier takes many years of acquired knowledge and experience. We must begin with the basics, have high standards and become really selective. I appreciate that it’s not always easy to find good specimens and that sometimes birds have to be used which may not fully conform to the ideal. However, as long as the breeder in question is aware of that fault’s likelihood to resurface in future and plans to breed it out accordingly, then progress can be made.